Be Number One with the Number Twos! You've tried metronidazole. You've tried a high fiber diet. What now? Learn how to manage chronic diarrhea in dogs! 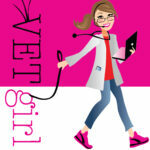 Join VETgirl for a 2-hour online veterinary CE webinar, where Dr. Peter Chapman, BVetMed(Hons), DECVIM-CA, DACVIM, MRCVS discusses approach to the canine chronic diarrhea patient. In this lecture, you'll learn how to work up the chronic diarrhea patient, including how to differentiate between large versus small intestinal diarrhea. This lecture will also review overall treatment recommendations (including diet change, antibiotic therapy, and immunosuppressives). An excellent review and some new info that I wasn’t up on–like the fact that if calcium deficient, IBD patients might not be absorbing the pred. properly. Thanks so much Dr. Amey! Dr. Chapman will be covering FELINE in 2017! Stay tuned! But you want to watch this On-Demand Webinar for CE credit?